They shock you; first they jolt you out of your senses and then successfully pin your attention down – if you have read the title of this post, you will know what I’m talking about. The use of disconcerting images that often border on the offensive, to draw the consumer’s attention, known as shock advertising or shockvertising for short, is a well-known marketing ploy that has been around in the West for quite some time now. Leading the brat pack of brands resorting to such tactics to boost its sales is the Italian clothing line, Benetton, which has shown a remarkable penchant in the past for stirring up the pot with its controversial ads. Imagine trying to eat at an outdoor restaurant with the image of a new-born baby covered in blood splashed across a billboard in front of you. Not exactly appetizing, is it? This was a famous 1991 Benetton ad (nicknamed “the Benetton baby” ad) that registered around 800 complaints in Britain itself till Benetton had to apologize to Britons for hurting their sensibilities (we are not putting the picture here as it is too gross !). Now, the pertinent question here is: what has a newborn baby covered in mucous (with an umbilical cored sticking out) got to do with the mundane business of selling sweaters? Well, nothing. Apparently, the creative director of Benetton, Oliviero Toscani, doesn’t want his company’s name to be forgotten in a hurry, hence the use of such compelling (& sometimes very offensive) images. 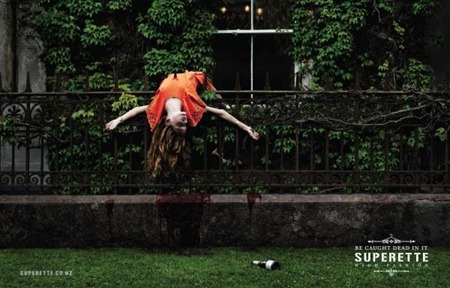 Another controversial fashion ad that uses gruesome images comes from the stable of the New Zealand based clothing company, Superette. The brand’s clothes are so chic that, supposedly, you would want to “be caught dead in it”. While one ad depicts a size zero model sprawled dead on a staircase, the other shows a model impaled on an iron fence – both models wearing the brand’s stylish clothes, of course. This kind of imparts a whole new meaning to the phrase “Die in style” (which incidentally would have made a good [even if somewhat clichéd] tagline too). But does shock translate to sales and to answer the original question, how far is too far? There are no easy answers. Cleverly executed shock ads, used once in a while, do tend to improve the sales of the company, but use it too often and the novelty of it fades. More often than not, the crass ones get banned and consumers may even boycott the brand altogether. India has so far not seen any such tasteless ads on its roadside hoardings, as the foreign brands are wary of upsetting the average Indian who is considered quite conservative; the new Reebok (Reetone) ads are the boldest that have been seen in recent times but surprisingly, Indians have accepted it docilely, with almost no protests or complaints coming from any quarter of the society. Furthermore, as the Indian consumer gets more and more jaded, there is always a chance that companies, indigenous or otherwise, might take to using provocative images to enhance its sales and to stand out from the crowd. Are potentially shocking and revolting ads the future of the Indian advertising industry? No doubt, shock-vertising grabs more eyeballs but it is definitely now new and maybe it should not be called the future of advertising. I have seen it in print since early 90's. I was 9 then… But then what is the future of advertising.. anyways.. nice read. Shockvertising is a good way to go deep in the brain, stay there and may have a good call for action as well.. I am unsure whether it is converting into sales.. Definitely a good idea for registering brand name in the market… However, if companies club it with some social cause, it works! Yes, I agree. Benetton has thrived on its controversial ads. Honestly, I think, shock ads are like jets of fire, if handled and aimed properly it can produce the desired effects (sales increase), if not, then you would only end up burning yourself (brand boycott). Shock is not equal to sales. Go through top 25 grossing iphone apps – they are filled with farmville / town building clones which emphasize building and nurturing. There’s something about adrenaline that makes people close their wallets. If you read my article (again), you will observe that I have said that “there are no easy answers” to the question of whether shock converts to sales or not. At times it does; the clothing brand French Connection UK’s 2004 “fcuk” campaign was deemed offensive, with Advertising Standards Authority (ASA) Britain’s media watchdog, pre-vetting all their ads and posters, but the campaign brought about four million pounds in PR value. That is shock equal to sales for you. Take the case of Benetton itself; it started out from being a humble Italian clothing company, it was the controversial ads that got people talking and today United Colors of Benetton has become the third most recognized brand in the world-following Coca-Cola and McDonald’s (http://www.bsr.org/). And how on earth are farmville/town building games shocking? Unless you are positively petrified of tilling your farmland, sowing seeds, building houses,etc. No offense bro’! But I, for the life of me, can’t figure out what is so shocking about “building and nurturing”!